Get your Steampunk Utility Belt right here! Comes with 2 fully functional pouches, dual D-ring hangers, a sword hanger, and more. The all-leather belt can be configured in any way you wish! Here's a Steampunk Utility Belt that is, without a doubt, the perfect companion piece to just about any steampunk ensemble. 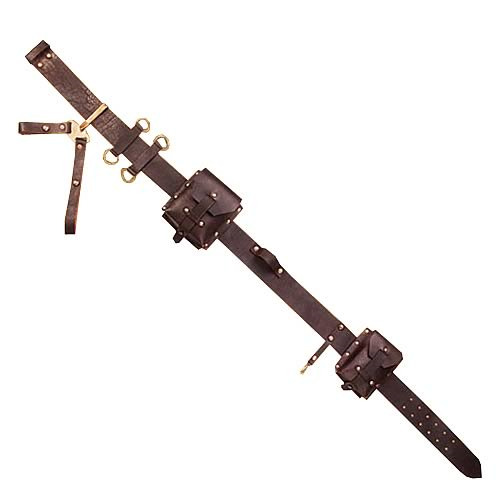 This high-quality, brown, all-leather belt measures about 52-inches long, and comes with 2 fully functional pouches, dual D-ring hangers, a miniature spring-clip, a map band, and a period sword hanger. The best thing is, all of these pieces can be configured on the belt in any way you wish! The aged leather and antique-brass hardware give this Steampunk Utility Belt a truly excellent appearance.